Anyone know why this isn't planned to be connected to I-35 South? It probably is; note the median widening at FM 1626. It's probably just a matter of getting the funding together for the last segment to connect the road to I-35. On the other hand, I think it's pretty odd how this segment of SH45 is being designed so tiny and narrow. I certainly hope they're securing enough ROW to expand this road in the future. I also hope they have zoning in place to slow commercial and residential development along that SH45 corridor stretch to I-35 so the ROW can be acquired in a practical manner. It would be a shame for them to allow a Mustang, OK style brain fart to happen. That's a reference to the SW extension of the Kilpatrick Turnpike in OKC being pretty much ruined. The ROW looks pretty standard for any Texas freeway, wide enough for at least 6 mainlines and 4 frontage road lanes. As with many toll roads in Texas, they're going to build it so that it can easily be widened in the future by paving either alongside the existing lanes or in the median, depending on the location. Looks like the same style of design as has been employed on the new segments of SH 99. Part of the road is pretty narrow and seems to be intended to have a barrier instead of a wide median. The narrowest part of the ROW looks like it's more than 5 times wider than the four lanes and barrier, at least 250 feet. I don't think it's intended to have a frontage road, since it would be a free parallel and get in the way of the shared use path. The narrowness of the road and lack of frontage roads may be intended to reduce the impact on the natural landscape, which has been a matter of contention. That segment of TX-45 in Austin will quickly grow to needing 3 lanes in both directions and then 4 lanes. The gap between FM-1626 and I-35 might have to be built with at least 3 lanes in each direction from the very beginning. And then they have the Western expansion of TX-45 to US-290 to consider in the long term. Both TX-45 and US-290 will become ever more important as gateways in and out of the Austin metro's West side. Right, the portion with the barrier looks exactly like the portions of SH 99 build with a barrier, and it won't be particularly difficult to pave another 30' or so alongside to widen to 6 lanes. The lack of frontage roads is because they aren't required by law to build them (new ROW, so no access rights to preserve) and to eliminate shunpiking, which would prevent it from being financially viable. I hate to see the traffic on the non-freeway segment of Mopac once this is open. I don't see how that segment of the TX-45 toll road would make traffic any worse along the Mopac or anywhere else in that immediate area. That toll road segment won't be connected to any other super highways. If anything traffic counts on that toll road will probably be so low the road wouldn't pay for itself with its own toll revenue. If that leg of TX-45 was connected to I-35 then quite a bit more traffic would probably be drawn onto that road and onto the Mopac. I'm kind of wondering why they didn't build up the freeway portion of the Mopac from Davis Lane down to TX-45 first. Perhaps they want to get this new section of TX-45 built just to secure the ROW. It's going to be even more tricky extending TX-45 West to US-290. I was just thru that area Friday night. Now that it has been given the go-ahead, the coming extension of TX-45 from Mopac to FM 1626 will make the traffic count explode overnight. The entire area south to southwest of Austin is desperate for a through connector route to I-35. The local Farm Roads and county roads are many years past their maximum capacity. The project has survived the legal challenge and is currently clear to proceed (as of the publication date) The article mentions an appeal may be filed. A federal judge in Austin denied an injunction Wednesday in the Texas 45 Southwest case, allowing construction to begin on the long-delayed tollway. Ruling a week after an all-day hearing on the injunction requested by the Save Our Springs Alliance and 11 other plaintiffs, Judge Lee Yeakel said in his 14-page ruling that the plaintiffs had “failed to establish a substantial likelihood of success on the merits” of their lawsuit. Renea Hicks, the lead attorney for the plaintiffs, said no decision had been made on whether to file an emergency appeal to the 5th U.S. Circuit Court of Appeals in an effort to prevent the start of construction. A three-judge panel has cleared the project to begin construction, which the toll road agency says will start on Tuesday. The initial construction work is the clearing of brush from the corridor. The main lawsuit is still in progress and could go to trial within the next few months, so the project remains at risk for legal delays. A three-judge appellant panel Friday rejected a request to prevent construction of the tollway. Highway officials say construction on the southwestern Travis County road should start Tuesday. Plaintiffs had argued that construction now will do irreparable harm to endangered species. A three-judge appellate panel on Friday denied a request for an injunction in the Texas 45 Southwest case, clearing the way for construction on the tollway to begin next week. The decision came hours after a hearing in the federal lawsuit, in which lawyers for the environmentalists opposing the road had asked the judges to intervene. A highway in that location has been in local plans since the late 1980s, and was the subject of an earlier lawsuit that was settled in 1992. This time, with the passage of time and a new design, the project was challenged in federal court in February by the Save Our Springs Alliance and 11 other plaintiffs, including two former Austin mayors, who argued that the road should have been studied in conjunction with two other related projects in the South MoPac Boulevard corridor. An Austin federal judge Friday rejected a legal challenge to three Southwest Austin road projects, according to transportation officials. The upshot, according to Mike Heiligenstein, executive director of the Central Texas Regional Mobility Authority, is that the agency can continue construction of Texas 45 Southwest, which began in November, and resume planning for toll lanes that would be added to eight miles of South MoPac Boulevard (Loop 1). Heiligenstein also said that the ruling by U.S. District Judge Lee Yeakel gives the Texas Department of Transportation clearance to build underpasses on South MoPac at Slaughter Lane and La Crosse Avenue. Bids were opened for a related project today, the extension of the Loop 1 (Mopac Blvd) main lanes to the beginning of the tollway. It's good to see this long-delayed project finally move to construction. It features a diverging diamond interchange (double crossover diamond interchange) at Slaughter Road. Bidder 3 $54,217,133.44 +15.94% MCCARTHY BUILDING COMPANIES, INC. Bidder 4 $54,994,763.37 +17.60% OHL USA, INC. Bidder 6 $56,700,516.01 +21.25% ANDERSON COLUMBIA CO., INC. Bidder 7 $56,812,049.03 +21.49% FLATIRON CONSTRUCTORS, INC. The court has dismissed the final possible legal challenge to this project. Construction is already substantially underway and, according to the article, ahead of schedule. A several-year legal fight to stop construction of two highway projects in Southwest Austin came to an end Tuesday when a federal appellate court ruled against the challenge from environmental activists. Texas 45 Southwest and the “MoPac intersections” project, the 5th U.S. Circuit Court of Appeals ruled, received proper environmental clearance from the two agencies building them, the Central Texas Regional Mobility Authority and the Texas Department of Transportation. The 5th Circuit upheld the August 2017 ruling of Austin-based U.S. District Judge Lee Yeakel rejecting the lawsuit by the SOS Alliance, Save Barton Creek Association, Clean Water Action and nine other plaintiffs, including two former Austin mayors and country singer Jerry Jeff Walker. 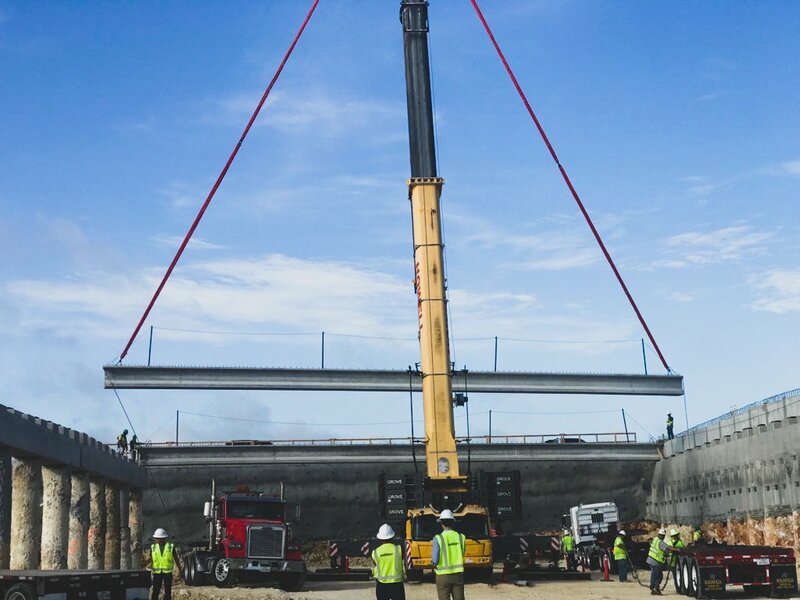 Construction of Texas 45 Southwest, a 3.6-mile, four-lane tollway that will connect the south end of MoPac Boulevard to FM 1626, began in November 2016 shortly after an earlier Yeakel ruling in the case (and a quick appeal to the 5th Circuit) on a temporary injunction sought by the plaintiffs. The road was projected to be done by early 2020, but officials have indicated that work is well ahead of schedule and that the highway may open considerably sooner.